(Nanowerk Spotlight) Developing highly active electrocatalysts for photoelectrochemical water splitting is critical to bringing solar/electrical-to-hydrogen energy conversion processes into reality. Non-noble metal chalcogenides, typically nickel selenide (Ni3Se2) nanosheets, have attracted enormous attention recently due to their high catalytic activity and abundance in nature. However, the poor electronic conductivity and instability of Ni3Se2 significantly impedes its practical application in commercial alkali electrolyzer systems. Fabrication of Ni-based functional hybrid materials possessing strong coupling effects between different components is a promising pathway to improve the overall water splitting activity and stability of the active components. Metallic cobalt sulfide (Co9S8) nanosheets are one of the most ideal candidates for the preparation of Ni-based (e.g., Ni3Se2 nanosheets) hybrids owing to the high electrical conductivity associated with their unique layered structure. Prof. Xinliang Feng, Technische Universität Dresden, Germany and colleagues have developed a novel 3D hierarchical hybrid electrocatalyst consisting of Co9S8 nanosheets strongly coupled with vertical Ni3Se2 nanosheets grown on electrochemically exfoliated graphene. 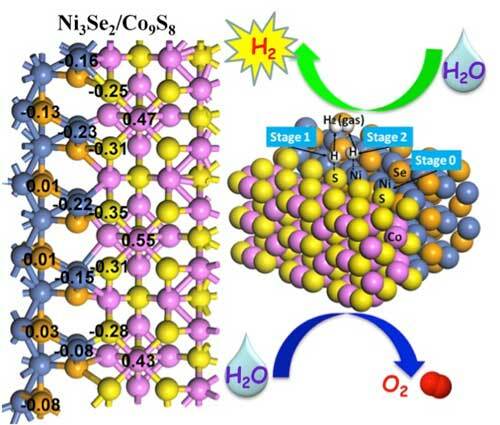 This research was published in Nano Letters ("Integrated Hierarchical Cobalt Sulfide/Nickel Selenide Hybrid Nanosheets as an Efficient Three-dimensional Electrode for Electrochemical and Photoelectrochemical Water Splitting"). Schematic representation of the synthesis process, collection of real-water and the hydrogen evolution reaction mechanism in this work. To approach the 3D hybrid nanosheets, a two-step procedure was developed. First, the Ni3Se2 nanosheet arrays were hydrothermally grown on the exfoliated graphene (EG) foil produced through an electrochemical exfoliation treatment of graphite foil in (NH4)2SO4 electrolyte. Then, the Co9S8 nanosheets were grafted onto the surface of the EG/Ni3Se2 through a facile solvothermal method, to form the three-dimensional EG/Ni3Se2/Co9S8 hybrid. The hybrid possesses a large surface area of 83 m2 g-1, unique 3D hierarchical architecture, highly conductive, strong interfacial coupling and interface reconstruction between Ni3Se2 and Co9S8. The resulting hybrid nanosheets exhibit remarkable activity and excellent stability for catalyzing hydrogen evolution reaction in basic media, affording current densities of 20 and 50 mA cm-2 at overpotentials of -0.17 and -0.23 V, respectively, which are superior to almost all existing Ni3Se2- and Co9S8-based catalysts. The researchers then further integrated the hybrid nanosheets with a macroporous silicon photocathode, and the results show that it can enable highly active solar-driven photoelectrochemical water splitting in both basic media and real river water. When used in an alkaline water electrolyzer, the hybrid is stable with better overall water splitting activity than that of the commercial Pt/C-Ir/C couple at high overpotentials. "This proposed strategy can provide a new and promising route for the design of efficient and robust 3D hybrid functional electrodes for a variety of electrochemical and photoelectrochemical applications, even for CO2 reduction and nitrogen fixation," the scientists conclude. Provided by Central China Normal University, Wuhan, as a Nanowerk exclusive.